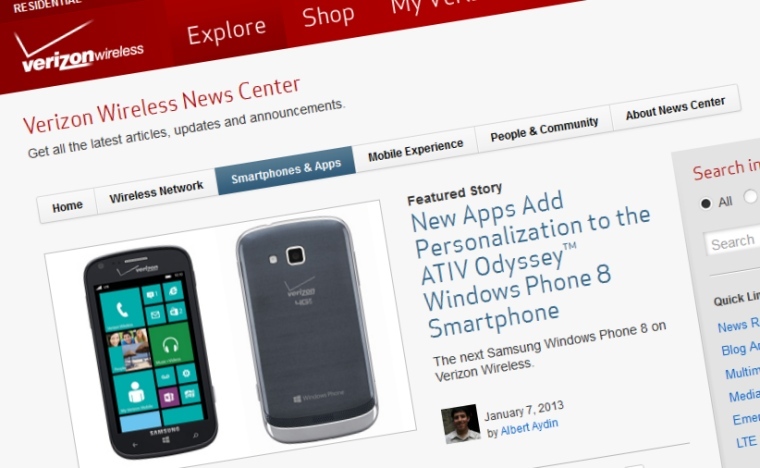 Following speculation at the end of last year, Samsung have confirmed at CES that their mid-range Windows Phone 8 handset, the ATIV Odyssey, will be available on the Verizon network in the US. With LTE support, the familiar dual-core 1.5GHz Snapdragon processor, and a decent 2100mAh battery, the Odyssey is a good fit in the Windows Phone 8 range. Following the example of Samsung's first WP8 smartphone ATIV S, the Odyssey comes with support for MicroSD cards, expanding the 8GB storage that is built in to the handset. We're expecting to see Samsung's standard suite of additional applications appear on the Odyssey, including ChatON, Photo Editor, and the Mini Diary. But we're also going to be interested to see what Verizon add to the application suite as well... and if users will be able to remove those applications from the device. There is no pricing information yet, but availability is expected in 'a few weeks'. You can find more details on Verizon's website.